EPA will conduct a public meeting on June 10, 2009 from 8 am – 5 pm (Eastern Time) at the Holiday Inn Capitol – Washington, DC . To register for the meeting, please fill out and submit the Water-Efficient Single-Family New Home Public Meeting Registration Form by June 3, 2009. EPA will hold an additional public Webinar on June 22, 2009 from 1 pm – 4 pm (Eastern Time) for those unable to attend the Washington, DC meeting. To register for the Webinar, please fill out and submit the Water-Efficient Single-Family New Home Public Meeting Registration Form by June 17, 2009. EPA released a draft specification for water-efficient single-family new homes on May 22, 2008. Based on substantial feedback and significant revisions, EPA released a revised draft specification on May 8, 2009. This specification establishes the criteria for water-efficient new homes under EPA’s WaterSense program. When finalized, it will be applicable to newly constructed single-family homes and townhomes, three stories or less in size. In addition, to meet the Landscape Design Criteria (Section 4.1.1), the builder may choose to comply by completing a water budget. EPA has developed a tool to guide these calculations. The first version of the tool, released on November 20, 2008, was based on methodology developed by the irrigation industry as described in Irrigation Association’s Landscape Irrigation Scheduling and Water Management (2005). This second version incorporates additional research and recommendations suggested by stakeholders as part of the public comment process. The third-party verification of WaterSense labeled new homes is intended to confirm that the builder has met the criteria of EPA’s specification for water-efficient single-family new homes. The inspection and irrigation audit guidelines explains how inspectors verify that the criteria have been met and must be followed in conjunction with the specification. These guidelines have been revised to incorporate revisions to the specification criteria and methods by which they will be tested. EPA is interested in obtaining input from all interested parties on the revised draft specification materials. The public comment period is open for 60 days and ends on July 7, 2009. Please send any comments or suggestions regarding the revised draft specification materials to <watersense-newhomes@erg.com>. All comments become a part of the public record. In order to facilitate the consistency and utility of comments received, please submit your comments using the Template for Public Comment Submission (MS Word) (1 pp, 50K). You may either download and save this document template and directly insert your comments, or attach your comments in your own document, provided that you clearly reference the text/section in question, your recommended changes, and why you think these changes are needed. Additionally, WaterSense will be conducting a public comment meeting in June 2009. Additional information will be posted as it becomes available. For more information about the water-efficient single family new home specification process, including the first draft, public comments, and EPA’s response to the public comments of the specification and water budget tool, please see the Water-Efficient Single-Family New Home Specification Background Materials page. More than 1 trillion gallons of water are wasted in U.S. homes each year from easy-to-fix leaks. That’s why ecoTransitions is participating in Fix a Leak Week, March 16 to 20, 2009, and we encourage you to join us. Sponsored by the U.S. Environmental Protection Agency’s (EPA’s) WaterSense® program, this week is an opportunity to improve the water efficiency of your homes by checking for and fixing leaks, which waste an average of 11,000 gallons of water per home each year. That’s more than enough water to fill up a backyard swimming pool! If you decide it’s time for a new commode or faucet, look for WaterSense labeled products, which use 20 percent less water and perform as well or better than standard models. The vast majority of leaks can be eliminated after retrofitting a household with new WaterSense labeled fixtures and other high-efficiency appliances. You can reduce faucet leaks by checking faucet washers and gaskets for wear and replacing them if necessary. If you are replacing a faucet, look for the WaterSense label. If your toilet is leaking, the cause is most often an old, faulty toilet flapper. Over time, this inexpensive rubber part decays, or minerals build up on it. It’s usually best to replace the whole rubber flapper-a relatively easy, inexpensive do-it-yourself project that pays for itself in no time. To ensure that your in-ground irrigation system is not leaking water, consult with a WaterSense irrigation partner who has passed a certification program focused on water efficiency. As a WaterSense partner concerned with preserving our nation’s water supply, ecoTransitions can help you learn more. Use our water savings calculator to determine how much water you can save by installing a Caroma Dual Flush toilet. Fix a Leak Week is March 16 to 20, 2009. Grab a wrench or contact your favorite handy person, plumber, or WaterSense irrigation partner to address leaking toilets, faucets, and irrigation systems around your home. Visit the WaterSense Web site to learn more. WaterSense is a partnership program sponsored by EPA. Its mission is to protect the future of our nation’s water supply by promoting and enhancing the market for water-efficient products and services. Currently, there are nearly 250 WaterSense labeled toilets, 500 labeled faucets and faucet accessories, and more than 550 certified irrigation partners. 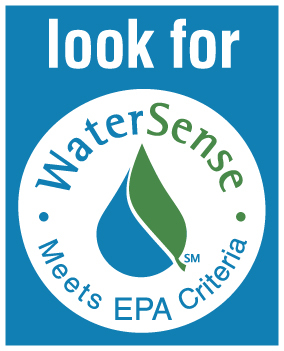 WaterSense labeled products must achieve independent, third-party testing and certification to prove they meet EPA’s rigorous criteria for efficiency and performance. Chapel Hill, NC — NC’s leading Energy Star builders, Anderson Homes and sister company Vanguard Homes, continue to lead the way in “green” innovation. -Chosen as one of only 7 builders in the country to participate in the Environmental Protection Agency’s (EPA) WaterSense new homes pilot program, Vanguard Homes has received the first ever WaterSense label on a new home. WaterSense labeled new homes by Vanguard will be designed to be at least 20 percent more water efficient than homes currently being built under traditional standards, saving homeowners more than 10,000 gallons of water per year. These homes are designed to use significantly less water inside and out, through efficient plumbing fixtures, hot water delivery, appliances, landscape design, and irrigation systems. The first WaterSense labeled new home built by Vanguard Homes is located in the community of Briar Chapel in Chapel Hill, NC. This “Sensibly Green Concept Home” is the first home in the country to receive the EPA WaterSense label and has achieved gold level certification from the Green Home Builders of the Triangle and National Home Builder’s Association Green Building Standard. “This kind of WaterSense label is a milestone for us as a builder and leader in the industry, and we strive to achieve that kind of excellence every day,” says Kip Guyon, President of Vanguard Homes. “It is so important to maximize homesite integrity, while minimizing environmental impact”, he also added. Vanguard Homes’ WaterSense labeled new home conserves water by using WaterSense labeled dual flush toilets, bathroom faucets and high-efficiency shower heads. In addition ENERGY STAR® rated clothes washers, dishwashers, a whole house filtration system and a hot water circulation pump work in harmony to save water. WaterSense was created by the U.S. EPA in 2006 to help Americans save water for future generations. WaterSense labeled new homes, while saving water resources as well as money for the homeowners, also lessen the stress on water and wastewater infrastructure systems across the country. For more information/education of the importance of WaterSense labeled new homes by Vanguard Homes, please visit http://www.epa.gov/watersense/.